For the past 70+/- years my husband has enjoyed having Speculatius cookies as an important part of his Christmas tradition. 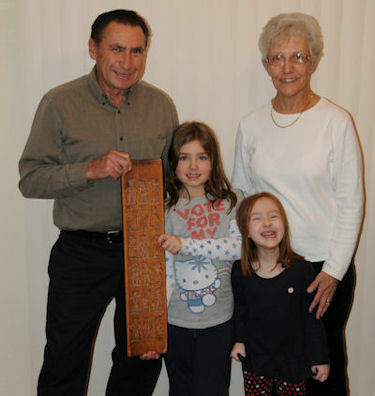 He inherited the board from his mother in the mid 1980’s and she inherited it from her godfather, August Neuhaus who was born in 1884 and emigrated to the U.S. from Germany in 1923. August Neuhaus was very fond of my mother-in-law, Ilse Pryzbylla, who he sponsored when she emigrated from Essen, Germany to the U.S. in 1927. Mr. Neuhaus also had a daughter, Emma who was the same age as Ilse and they were friends well into their 80’s. Our board is very much like the one shown in the Backerei Wardenbach site and is truly a treasure and we continue to use the recipe supplied by A. Neuhaus which uses ammonium carbonate as the leavening agent. Earlier this month our three granddaughters came on a Sunday afternoon and they helped us make cookies – two were a great help – the four year old was the best taster! Your website gave us the opportunity to see another board – this was a first for us. My mother-in-law passed away in 1997 – she would marvel at how much research can be done via the internet. Through the years we have shared these cookies with many people but no one was ever familiar with them or the procedure involved to make them. It is a great deal of work to press the dough into the mold and then using a piano wire on a piece of metal to cut the excess dough off. The trick of getting them unmolded is then hitting the board on a butcher block to dislodge them. A lot of effort, but well worth it. Our recipe starts with 5 lbs. flour and makes “a lot of cookies” but they get better with age and we’ve never thrown one out yet! Do you have any idea of the value of something like this – like I said your site gave us a view of a similar board. Springerle boards are more common. Karl & Alice Faller with their Speculatius mold and their granddaughters. Nicole and Jessica enjoyed their first year as helpers! *Ammonium Carbonate is a leavening agent which can be purchased on line or sometimes at a local pharmacy. Beat butter and sugar together until creamy. Beat in eggs, spices and lemon rind. Lightly mix crushed ammonium carbonate into the flour with a fork. Add milk and flour mixture alternately setting aside about 5 cups flour. Put both batches of dough into a large plastic bowl and add the last five cups of flour and mix in by hand or with a wooden spoon. Form dough into 6 or 8 blocks 4” x 6” x 1” and wrap in waxed paper. Refrigerate overnight. Flour part of the spekulatius board and press dough into mold; using tool, cut off excess dough and turning board over hit it on a heavy piece of wood or butcher block which will release the formed cookies from the mold. Place on cookie sheet lined with parchment paper and bake in 375 degree oven until golden brown. This recipe makes 6 large tins of cookies. Make at least two weeks ahead since they get better after 10-14 days. Make whole recipe – according to Grandma Faller half a recipe never turns out right? MOLD: Never wash the cookie mold – brush off all flour and debris and clean up as much as possible. Store in dry place. 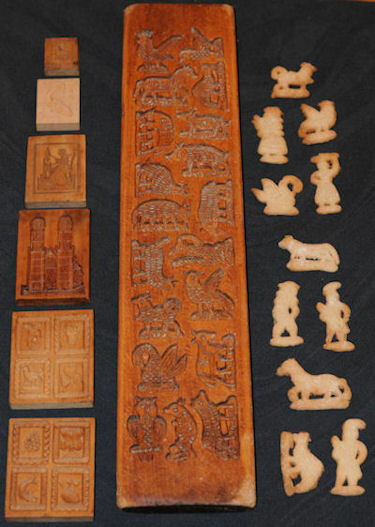 This recipe and hand carved cookie mold was given to Grandma Faller by her godfather, August Neuhaus who brought it here from Germany in the early 1900’s. Please treasure this and always keep as a family heirloom.